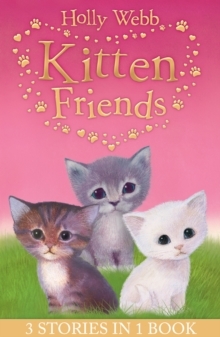 Three heart-warming kitten stories to treasure in one book, from best-selling author Holly Webb. Holly Webb’s Kitten Friends includes Lost in the Snow, Smudge the Stolen Kitten and The Kitten Nobody Wanted. This gorgeous collection would make a fantastic birthday present for anyone who loves kittens. Lost in the Snow: Ella falls in love with Fluff, the smallest kitten in the litter of farm cats, but her parents aren’t sure she’s ready for a pet. Then Fluff disappears, will the two ever be reunited…? Smudge the Stolen Kitten: Olivia and her kitten Smudge are inseparable – until the tiny kitten goes missing. Could her brother’s naughty friend have something to do with it? The Kitten Nobody Wanted: When Mia’s cat Sandy dies, she doesn’t think she’ll ever be able to have a pet again. But then she meets adorable kitten Whiskers – can Mia find a place in her heart for the little cat? Holly Webb’s Animal Stories have sold over a million copies in the UK. From stolen kittens to lost puppies and runaways, Holly’s tales of puppies and kittens have won her legions of fans. The perfect series for animal lovers aged six and up.